Hartmann visualization of "compound binary" asteroids formed in low-velocity collisions 1978 painting (upper left), 1980 painting (upper right), 1996 painting (lower left) – compared to an image of Ultima Thule by the NASA New Horizons mission,lower right. Credit: NASA/APL/SWRI. On Jan. 2, the New Horizons spacecraft made the most distant flyby ever attempted, successfully returning images of the Kuiper Belt object Ultima Thule. While the world is agog at the so-called "snowman" shape of this icy asteroid, the concept is nothing new to PSI scientist and artist, Bill Hartmann. The figure shows paintings that Hartmann made from 1978 to 1996, to illustrate the possible outcome of very low-velocity collisions of distant asteroids. 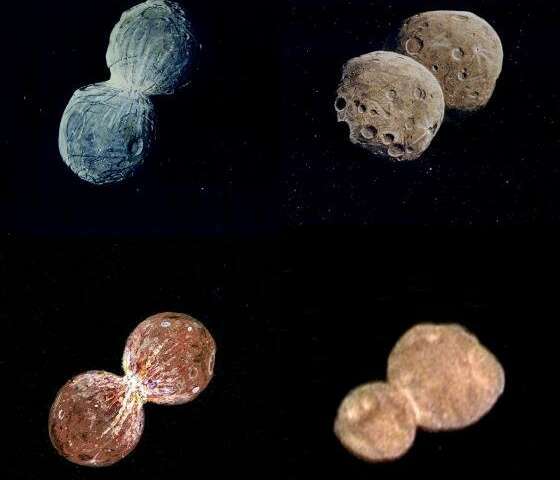 These are compared with the first released color image of Ultima Thule. The story goes back 50 years. In 1969, University of Arizona astronomers at the Lunar and Planetary Lab ("LPL"), Larry Dunlap and Tom Gehrels, noticed that as the asteroid 624 Hektor, far beyond the main asteroid belt in the region of Jupiter showed extreme changes in brightness as it rotated. In the late 1970s, Hartmann (having recently founded PSI) and Dale Cruikshank (then at the University of Hawaii), observing at 14,000-foot Mauna Kea Observatory, proved that the brightness change was not caused by one side having brighter materials, but rather by a very unusual elongated shape. Hartmann became intrigued with how such bodies might have formed in the primordial solar system by low-velocity collisions of asteroidal bodies, from which the planets were growing. These still-theoretical bodies were called "compound binary" asteroids – "binary" meaning two bodies, and "compound" indicating that they were touching each other, instead orbiting around each other. PSI's Stu Weidenschilling published a paper on how the shapes of the two halves of the compound binary might have their shapes distorted, depending on their bulk strengths and the rotation rate of the object. Hartmann's 1978 painting showed the compound binary concept with grey colors as found on the Moon. No such bodies had been seen at close range, but Hartmann wanted to depict them. "My astronomical paintings are not just flights of fancy, but a serious attempt to make something both beautiful and realistic out of what we humans have learned about other worlds," Hartmann said. By 1980, Cruikshank and Hartmann had shown that many bodies in the outermost solar system had a dark, reddish brown color, and his 1980 and 1996 paintings added Hartmann's estimate of how this color might look. Ultima Thule was not only the first obvious example of a compound binary structure, but also looked strikingly like Hartmann's 1996 visualization from 22 years ago. Hartmann happily notes that his 1978 and 1996 paintings show bright material in the "contact zone" where the two bodies collided, and sure enough, the New Horizon spacecraft photo also show bright material there. "We live in an era where scientific findings are being criticized, but if we can predict phenomena we see on other worlds, we must know something about what we are doing," Hartmann said. It seems pretty obvious to me that Comet 67P is also a contact binary that has incidentally undergone a lot of surface ablation on its' many excursions around the Sun. The most striking difference, to me, is the symmetry in the paintings. Each half is about the same size. Whereas UT and 67P are very asymmetric, which makes sense in retrospect. There's a range of sizes that can form contact binaries, and the chances of any given pair being different sizes must be higher than the chances of them matching. This about clinches the case for planetesimals formed by streaming/gravitational instability, ending the reign of hierarchical/pebble/core accretion, followed by binary spiral-in merger, resulting in a final touchdown more graceful than the docking of a Soyuz spacecraft with the ISS.